FOX Sports has used unique camera views like Catcher Cam, Diamond Cam and Gopher Cam in other sports to bring viewers closer to the action. Similar in size to the latest evolution of Diamond Cam, Ref Cam is a small, lightweight, wireless high definition, radio frequency transmission camera showing the point of view of the only other person inside the Octagon with the fighters. During Saturday’s broadcast, the lens will be placed at the top button of the referee’s shirt. The power-source, a long-life lithium ion battery and the transmitter are worn as a light chest vest under the referee’s shirt. Mixed martial arts promotions such as PrideFC and EliteXC have offered a similar camera view in the past. UFC on FOX 4 takes place inside Staples Center in Los Angeles. 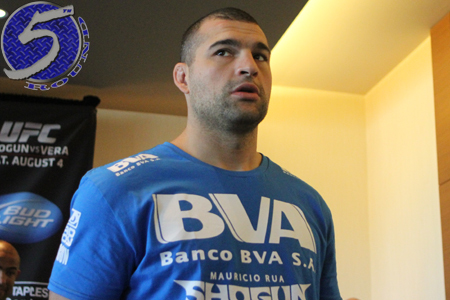 A light heavyweight affair between Mauricio “Shogun” Rua (Pictured) and Brandon Vera headlines the freebie fight card.